I tried to make this tutorial for users with medium to advance linux administrative skills. Even if you are not one of those one of them feel free to leave a comment and I shall try to help you out. 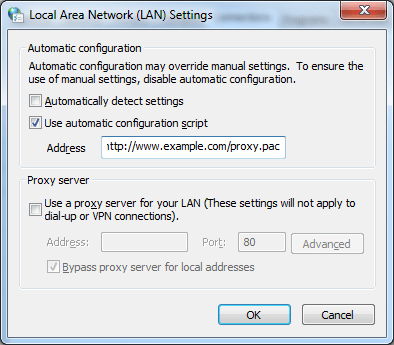 To make your Proxy Auto Configuration APC work you need a PAC file and a server to host it. In this configuration file, I am declaring my proxy server as 192.168.0.250 port 3128. The client should use this proxy for http, https and ftp requests. After we are down with creating a PAC file appropriate for the network and hosting it on a web server from where web client has a direct access to, we need to configure the client use the PAC file for proxy configuration. To ensure that the file is accessible from the browser, try accessing the url from the browser with no proxy setting. This should download the file in the local machine. How can I retrieve WPAD URL programmatically if the device is under a workgroup?